EAST HANOVER, NJ — Paper Mart Inc., a leading supplier of paper, envelopes and packaging to the industry, is celebrating its 75th anniversary. The company began operating in 1939 with Herman Levey’s vision to establish a distributorship to sell paper and envelopes to printers. Located in a rented site at 54 Clinton Street, Newark NJ, with a net worth of $1000, Paper Mart was incorporated as a New Jersey based company in September 1940. Herman was joined by his two eldest sons, Yale and Joe, and hence the family business began. Herman’s youngest son Myron, at 11 years old, would perform janitorial duties and odd jobs for the company. In 1941 Yale and Joe went into defense factory jobs because the company could not afford to pay their wages. They would however work odd hours after their regular jobs at no wage to keep Paper Mart going. After the sudden death of Herman in 1946, Yale and Joe left their defense jobs to work at Paper Mart full time. Myron was planning to attend college at this time yet would continue to support Paper Mart, working after school and on weekends. 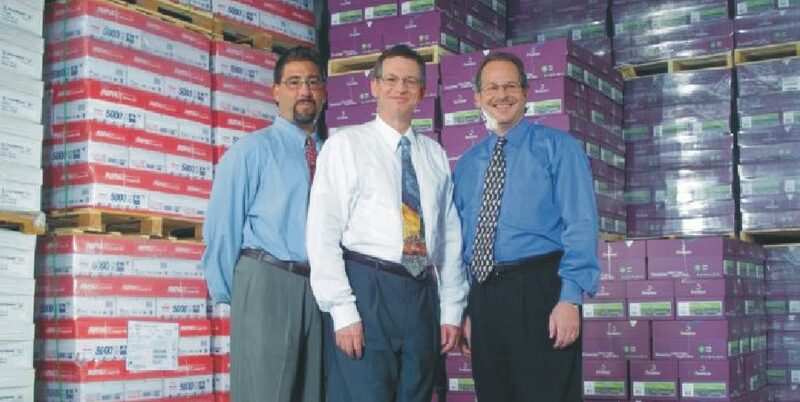 With boundless energy, proficiency in developing theories and implementing strategies, Myron assumed a major role in the management and the subsequent growth of Paper Mart. His efforts and focus to procure mill franchises as well as new customers were making a significant impact on Paper Mart. His brothers, recognizing Myron’s value, made him an equal 1/3 shareholder and full time employee. Today, four generations and 75 years later, Paper Mart continues to uphold and maintain the traditions and values set forth by its founders. Preserving the Levey’s family leadership into the third generation, Jerold Levey, together with Howard Levey and Jonathan Block, continue to support a hands-on approach to managing the company while maintaining a solid focus on understanding their business, adapting to new technologies, industry trends and customer’s needs. “My Grandfather, Father, Brothers, Uncles and Cousins built our company on the foundation of hard work, honesty, resourcefulness, and accountability,” said Jerold Levey, President and CEO. Combined with unmatched expertise in paper and envelope selection and usage, Paper Mart is committed to offering one of the most comprehensive inventories available today. Paper Mart maintains an inventory in excess of 16,000 types of paper, envelopes and specialty products all situated in its 200,000 square foot facility. The facility operates 24 hours per day, 5 days per week and as a stocking merchant, Paper Mart insures fast turn-around and next day paper-on-demand deliveries within the Tri-State area. Additionally, Paper Mart offers a world class envelope printing department that generates millions of high quality impressions per day to qualified customers. Other services include an in-house cutting and finishing operation which cultivates the key ‘value added’ processes of custom cutting, micro perfing, specialty drilling, precision scoring, folding and more. Paper Mart Inc. together with The Paper Mart Store and The Paper Mart Store on-line work with a diverse group of customers – from printers, design professionals and mailing houses to government agencies, educational institutions, nonprofit groups and healthcare facilities. From large corporations to SOHO businesses including retailers, restaurants, as well as the individual paper craft enthusiast, each customer receives unparalleled service and support. There is no such thing as ‘voicemail’ at Paper Mart – all Paper Mart customers receive responsive and personalized service from a ‘live’ expert Monday through Friday 8:00 AM to 6:30 PM. EST. “At Paper Mart, we understand the challenges that our customers face and are dedicated to investing our time, experience, and personalized service in an effort to support our commitment to customer satisfaction,” Levey said.